A fully illustrated bestiary featuring 135 entries and 257 individual statblocks, as well as lore to help understand each creature and provide inspiration on how to include it in an adventure. 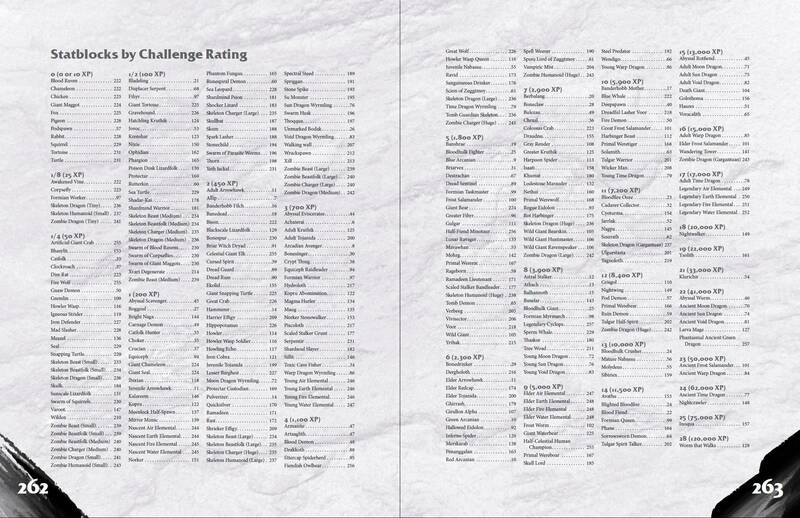 An appendix of 38 beasts and miscellaneous, low Challenge monsters. A section featuring skeletons and zombies that can represent a wide variety of undead creatures from humanoids of various sizes to monsters and dragons and allows both DMs and players options to create such undead from creatures not covered by the Monster Manual entries. This list also ties directly into the abilities of some monsters featured in the bestiary. An appendix of air, earth, fire, and water elementals ranging from Small to Gargantuan size to use as monsters or to summon with spells like conjure minor elementals or higher slot levels of conjure elemental. A list of easy to apply monster templates that can transform a creature’s nature without requiring significant recalculations of its statblock and can be applied on the fly. This includes a template that allows you to turn any creature into a legendary encounter and thereby a suitable boss monster. Never mind, I just found it is! Thanks! :) Will buy this! Hi Paul, asterisks mark rules that are explained on the reference page. Wow, what a great collection of critters. Very nice! Is it legal to use some of these monsters in an adventure created for the dmsguild? Just thought I would ask. Hi just a quick question, I've heard mention of this being rules for fantasy grounds? I was of the opinion it was for D&D 5E which is correct? Both are true in a way. This page right here is for the pdf and print version of the Critter Compendium for 5th Edition D&D. Fantasy Grounds is not a different game, it's a virtual tabletop software which you can use to play games like D&D online with other people. The module for Fantasy Grounds also contains 5th edition rules but they are implemented for the fantasy grounds app. Those are sold on a separate store page. What is the difference between Standard and Premium Heavyweight? For reference, what would the WotC Monster Manual be considered, premium or standard? The difference is in color depth. Premium offers a wider range and more vibrant colors. This is hardly noticable or doesn't even make a difference at all in many images. But when it comes to bright reds and purples, premium will show them much more vibrantly. The WotC Monster Manual was probably printed in a very different process, so i can't say exactly, but I would guess it would be closer to Premium in terms of color depth. your last reply only shows up as an empty post to me. If you had a followup question or anything else to say, im afraid you'll haveto repost it. Hi Matthew sorry for the confusion. Both versions have the same number of monster stablocks. The perceived difference comes in because I didnt mention the number of statblocks in the Appendices for zombies and skeletons, elementals and monster templates. So the Fantasy Grounds module does not include any monsters that aren't in the PDF. any idea when the kobold fight club will be done? I like how the monsters are represented here. They fit really well into the theme of the fallen world. It was a very good read. Thank you very much! It was a challenge to converse such good lore in the case of the cosmic dragons. For the other monsters, that of my design, I haven't made stat blocks. I have never designed crunch before. So, in case of monsters, what advice would you give me? If you want to make your own monsters, first off think about what makes them unique. Build their abilities around that. When writing abilities look at how they are written in the monster manual as well as check on the rules in the Players Handbook that they interact with, it helps writing rules that are consistent and make sense. I often see people making the mistake of wording their rules in a way that it doesn't make sense in the context of the game's ruleset. You should definitely make an attempt at reading and understanding whatz the DMG says about creating monsters, especially how CR is calculated it can get a bit convoluted with resistances immunities, and special abilties that allow the monster to deal or avoid damage. This overdelivers in a big way! Awesome ideas. And many of my favourites from 4E return! I have a question - I'm developing a homebrew setting and publish lore on my blog. May I use some monsters (cosmic dragons and primal lycnathropes) as fixtures. I make sure it is mentioned where they originate from? You're welcome to incorporate any of these monsters in your setting's lore. I don't (and I don't think I could if I wanted to) claim ownership of any of the creatures I created for this book. Only the statblocks I would have to ask you not to post publically. I'd be happy to see your blog post though! I intended to include only tweaked lore, anyway. Thank you very much! Was the Graft section removed from the book? I checked the demon section and appendix but can't find it. My current campaign is using Obyriths. Is there much lore in this product about them? great book just a few minor issues and its mainly creatures by enviroment so far only came accross 2 errors here but giant seal and sea leopard are categorised as cr 1/2 but everywere else there down as cr 1 also are zombie beastfolk small and medium supposed to both be cr 1/4? Thanks for thze heads-up. Both seals are meant to be CR 1, the mistake snuck in in the by-environment tables somehow. And yes both zombies are meant to be CR 1/4 even though the small version is a bit weaker. Mathematically they would be more of a high-end CR 1/8 but Undead Fortitude can make them tough to crack so I went with the next higher tier. I really wish I could get this in print :( Seems like a solid product from what I've seen. This monster compendium has been AWESOME since I got it. I gave it a short review as well after my initial read through and light uses, but now I've used it for a while and needed to say that I've continued to really enjoy it. The only thing currently that would make this better would be adding it to Kobold Fight Club's index so I could easily search up monsters for encounter building, but otherwise well done. A very enjoyable useful book to have for sure. Do you think you could add your monsters to kobold fight club? heres the current 3rd party spreadsheet, could you add your stuff to it and email it to one of the kobold press guys? It would really help out with building encounters with your monsters. I second this request! Was thinking about it... I can search your content easily on Fantasy Grounds, but with Kobold Fight Club integration would be more even more easier to apply filters! Alright everyone, I'm giving in. Working on the kobold fight club spreadsheet now. Unfortunately, I am not at all familiar with Kobold Fight Club. In case you are still planning to having the book printed and bound, if you hold out a little more, there will be a major update with a lot of corrections and cleanups so you may want to hold out. Thanks for the heads up! I'll hold off on getting it printed till the update then. And again, really love your product! And kobold fight club is an online encounter builder. Just checking in. Is v1.1 the update you were speaking about that I should print? Yes that was the big one. I don't expect to need to make any other ones as maor as this. Any big monster book, I'm down with. My only problem is I like physical items as oppsosed to digital; Is there a printer friendly version planned? I've read all the way to skull lord and I think he'll make for a great mid level boss. Hey Zach, you know what, that's a good idea. I figured the light grey background shouldn't be too bad for a printer but i guess it's still over 250 pages. I will make a less graphically intense version of it soon. Heya! Just wondering if there's a changelog available for v1.2 vs v1.1 - I already printed v1.1 and so am wondering what I need to go back and pencil in regarding stats?